Indiaï¿½s internet story is no longer about tortoise pace. Transformative changes are happening and it is time we take off our blinkers. Fact one: True broadband is here. Worldwide the minimum threshold limit for broadband is 4 Mbps. It may be surprising, shocking even, that 30% of Indian connections have an average internet speed of 4.1 Mbps. And it’s the well-reputed and credible Akamai saying it, and the speed tests were done before the 4G networks truly rolled out. Of course, the stereotype about India’s snail-paced internet comes from the Telecom Regulatory Authority of India’s (TRAI) almost maniacal insistence that broadband in India is 512 Kbps. As also the statistical nature of an average that hides the peaks and troughs. Fact two: Penetration of broadband is phenomenal. The growth in broadband is a 19% increase from the previous quarter, Q2 of 2016, and an unheard of 116% from the same quarter last year, Q3 of 2015. It’s true that India has to play catch-up with some of the digitally mature economies of the world like South Korea, Japan, Singapore and Hong Kong, which all have over 90% of connections crossings the 4 Mbps threshold. And it’s still some distance away to match the progressive policy regimes of Estonia, Finland and Sweden, where internet is almost crossing the rubicon of a fundamental human right. But an over 100% leap in a year is certainly a fast pace of catch-up. Fact three: Mobile internet is the story. This tale stands on two new pillars. First, the average mobile internet speed in India is a surprisingly fast 3.5 Mbps, just shy of the wired global broadband threshold of 4 Mbps. It was measured at the same time as the wired speeds by Akamai in Q3 of 2016. As with the wired connections, the Holy Grail is still far: the crown of the fastest average mobile speed in Asia-Pacific belongs to Australia at 12.8 Mbps, and globally sits on the UK’s head, which has an average mobile internet speed of 23.7 Mbps. Second, the mobile penalty score for India stands at 1.7X. It is an index for numerically exhibiting the difference between the speeds of wired and mobile internet. Any score less than 1 means that the mobile internet connection is faster than the wired one. The big surprise, global one, is that Laos tops the list with a score of 0.2X, closely followed by Jordan and Kazakhstan at 0.4X each and Iran, Israel and Afghanistan at 0.5X, 0.6X and 0.7X respectively. The bigger surprise, an Indian one, is that the country’s mobile penalty score puts it ahead of Japan and Hong Kong, two countries that you would automatically assume to have superior connections. Fact four: India likes cutting-edge technology. The world is running out of internet protocol addresses in the IPv4 series. Telecom operators have to move to the IPv6 series. It’s not an easy task and requires several existing pieces of the telecommunications infrastructure to be reconfigured and new pieces to be added simultaneously. The ground situation in India is no different. It suffices to say that moving to IPv6 is a technologically complex puzzle. Like all such moves, there is also an additional complication of keeping IPv4 series alive and running. The surprising part is that India is the global leader in IPv6 adoption along with Germany and the US. The year-on-year increase in adoption rate in India, from Q3 2015 to Q3 2016, is an astounding 715%. Most of the Indian telecom operators have been nimble on this front, but Reliance Jio Infocomm takes the honours with over half its connections and close to 75% of its traffic requests already on IPv6. Fact five: India’s internet story is rural. There are over 120 million Indians today living in the rural areas who are connected to the internet. That works out to about 36% of India’s total connected population. Boston Consulting Group (BCG) in a report based on an extensive survey at the ground level estimates that, by 2020, close to 315 million Indians living in villages will be connected to the internet. That means that in about three years, slightly less than 50% of Indians in rural areas are going to be connected. Market dynamics and social potential aside, connected Indians are going to be a big constituency. Humorous tropes aside, putting these five facts together unearths a different digital picture about India: a country that’s rapidly transforming, even as we seem to be caught up in an image that’s not accurate anymore. Such a transformation requires us to become more thoughtful and address three issues related to internet and digital governance. The first issue arises from the fact that this fast pace of development has been primarily achieved by market forces. 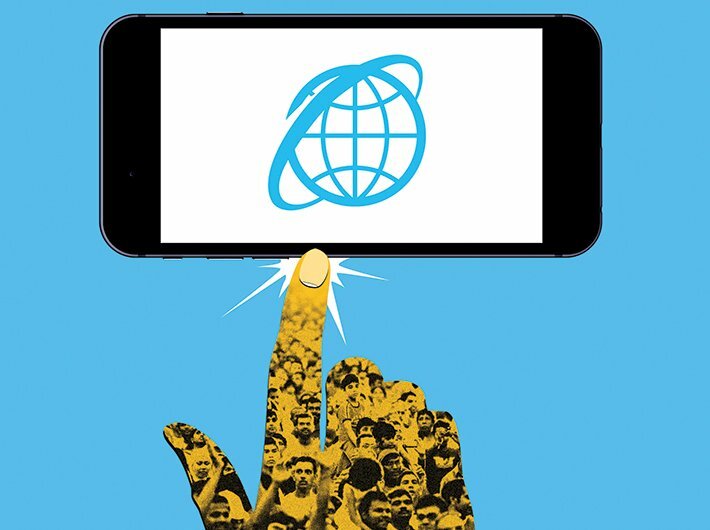 The India internet story is as much a story of demand as it is of supply. It’s within this context that one needs to start situating several government, market and joint initiatives to increase internet penetration for a cashless economy and an increased digital payments and transaction ecosystem. Just as the telecom sector, and internet, is benefiting immensely from having a single nodal regulator, a digital economy and society today needs a separate regulator. The internet is but a means to a digital way of life, one that’s as political, cultural, economic and social as the analog and brick and mortar world. Policymakers have to recognise the reality that market forces are going to penetrate rural India faster and quicker. These forces are also going to serve people in ways in which the government cannot imagine now. It’s in this acknowledgment that the first step towards a new integrated policy and regulatory blueprint for an emerging digital economy will be taken. It will help the government clearly define its role as a progressive regulator, while also locating its various efforts from establishing a last-mile fibre optic connectivity to seeding a digital payments ecosystem. The second issue emerges from the volume and the complexity of the digital transactions that have started taking place on the backbone of the internet. By all accounts, the complexity and interconnectedness of these transactions is only going to get denser and more intersected than before. It is one thing to provide high quality internet services and layer on top of it a multitude of digital services. It’s another to make it absolutely secure and credible. It’s time that the Indian national security brain bank at the prime minister’s office (PMO) starts thinking of having an integrated digital security command, something on the lines of integrated tri-services command. It might sound like overkill now, but to underestimate cybersecurity – something that’s internal, external, global and hyperlocal at the same time – can only lead to a certain downfall. The third issue is directly derived from the degree and level of engagement of the people with internet and the digital ecosystem. With internet becoming the backbone for governance, civic services, banking and non-banking transactions and for ‘smart’ solutions, Indians are being injected with digital technologies, either by default or by design. Their interaction and engagement is also becoming more mature and sophisticated. Internet can no longer be conceived only as a digital service, or as a system of bandwidth, connectivity, quality and better engineering and technological solutions. Internet is entering the realm of an entitlement and a fundamental right. This debate is beyond policy and regulation, and deals with some fundamental principles of democratic governance that we have taken for granted till now. It’s critical that these three issues are not seen in isolation, but rather as part of one single and emerging continuum. This continuum is throwing up a fundamental question: Is it time for a new constituent assembly that will bring together all the people and write the first principles for a new digital democratic order, much like how the founding fathers of India wrote the constitution? Maybe it is time for us to subvert the trope. Maybe it’s time for us to collectively build a new one. Let’s call it #Digital Republic. Swaminathan is contributing editor of Governance Now and consulting editor with Firstpost.com. He is a digital native and has lived through three dotcom bubbles and busts.